The construction progress can be clearly seen. The worship hall shines out with the sparkle glow of back-lighted stretch ceilings. Waveforms and curved design elements reflect the hilly Upper Palatinate surroundings. According to lead managers, the new facility will open it’s doors in February 2017. GRAFENWOEHR, Germany — The chapel overlooking the Netzaberg village here is on pace to open its doors for services in February 2017, according to lead managers. Begun in November 2013, the new chapel will replace the aged one located on Tower Barracks. The $15 million project, with a 115 foot tower, will be the new home for many denominations. Plus, new features will accommodate more people and services. While the old Grafenwoehr chapel fits about 180 people, the new main room of the Netzaberg chapel will fit about 600 people and can be divided in two rooms. Additional classrooms and child care rooms will also be available. The latest features such as video projectors, a sound system and stage lights will be integrated. 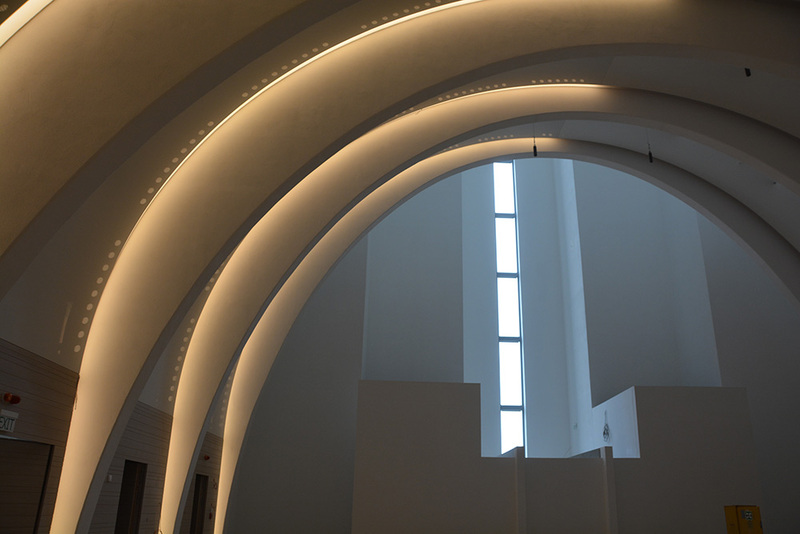 In addition to a design geared toward flexibility and usability — the chapel includes a mobile Christian altar and a baptism pool — local and environmentally-minded construction went into the chapel’s design. Beside the technical finesse, the architecture is extraordinary. Waveforms and curved design elements reflect the hilly Upper Palatinate surroundings, said Hoesl. Additionally, the worship room will have an overflow area, which encompasses a second stage, allowing for two worship services held at the same time, said Maj. Michael Frailey, the USAG Bavaria chaplaincy resources manager. Netzaberg is part of the Efficient Basing Grafenwoehr (EBG) construction program which started in 2001 to prepare Tower Barracks for the stationing of a brigade-size element of troops with a total cost of $1 billion. Netzaberg Chapel is the last project of that program. There will be a commissioning and dedication ceremony Feb. 3, said the USAG Bavaria chaplain, (CH) Col. Kevin Pies.